So delighted with the imminent reprint of Misty by 2000 AD, and the huge interest it’s generated. I’ve just done an interview with Samira Ahmed for BBC Radio 4’s art and culture show Front Row for broadcast tonight at 7.15pm (6 Sept 2016). 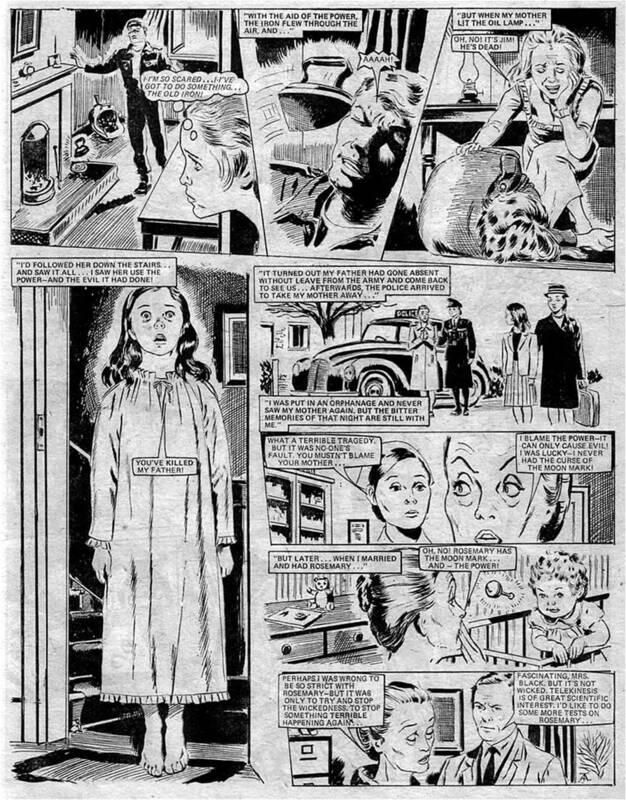 And The Herald has a great in-depth Q&A with me on the subject (Graphic Content: Pat Mills tells the behind-the-scenes story of 1970s girl horror comic Misty). But of course, that interest in Misty (and girls’ comics in general) has always been there. I first wrote the below post in October 2012 as a digression on a series of posts I wrote on Judge Dredd, back when the idea that Misty would actually get a decent reprint seemed like an impossible dream. In terms of reader comments, the Misty post is probably one of my most popular blog posts. So here we are in 2016, and 2000 AD have done a fantastic job of reprinting two popular Misty stories: Moonchild (written by me, art by John Armstrong), and Four Faces of Eve (by Malcolm Shaw and Brian Delaney). Coincidentally, I’m in the middle of writing the first text novel in a series with Kevin O’Neill that could be described as a darkly humorous alternative history of UK comics publishing in the 1970s. And right this very week I’m writing the fictional account of how Misty was created. You could say, it’s my own vision of how Misty could have been. The novel series is called Read Em And Weep. Volume one is called Serial Killer. Did I mention that it’s also a thriller? If you’re a fan of murder mysteries, flawed and eccentric characters, 70s nostalgia, insider knowledge on creating comics, childhood revenge, and film noir (it’s got a lot of noir! ), you’ll probably like Read Em And Weep. It’s due out in February 2017 and volume 2 will be published later the same year. I’ll be releasing more info over the next few months (look out for a cover reveal at the end of October), so click here if you want to stay in touch and get the latest news. One more thing: I also wrote a series of posts called The Formula around the subject of Misty, prompted by questions from Catherine, a PhD candidate studying scary kids’ stories, who was producing a sample Misty-inspired comic as her final project. She wanted to know how comics are produced and this prompted me to explain some of the inner workings of the creative process. So if you’d like to know more about creating comics, with particular reference to Misty, check out Part 1 – Inspiration. And here’s my original October 2012 post! Apologies for this digression from the Judge Dredd story, but there is so much interest in Misty – the female 2000AD – that there is now a Bring Back Misty Facebook group. Because Misty was connected with the origins of 2000AD, I thought I’d talk about it here. But given the success of 2000AD, I felt if I was going to create another hit for IPC juveniles, I should really have a share of the profits. John Sanders said his board of directors would never agree but I wouldn’t budge either. So I left and went back to freelancing. Later, I relented and agreed to be the consultant editor for Misty and guide it on its way, but without taking responsibility for it, like 2000AD. I also agreed to write the lead story for Misty – Moonchild – inspired by Carrie; and later Hush, Hush, Sweet Rachel, inspired by Audrey Rose, a story about reincarnation. The pages below give you a taste of Misty (apologies for the poor scan quality). 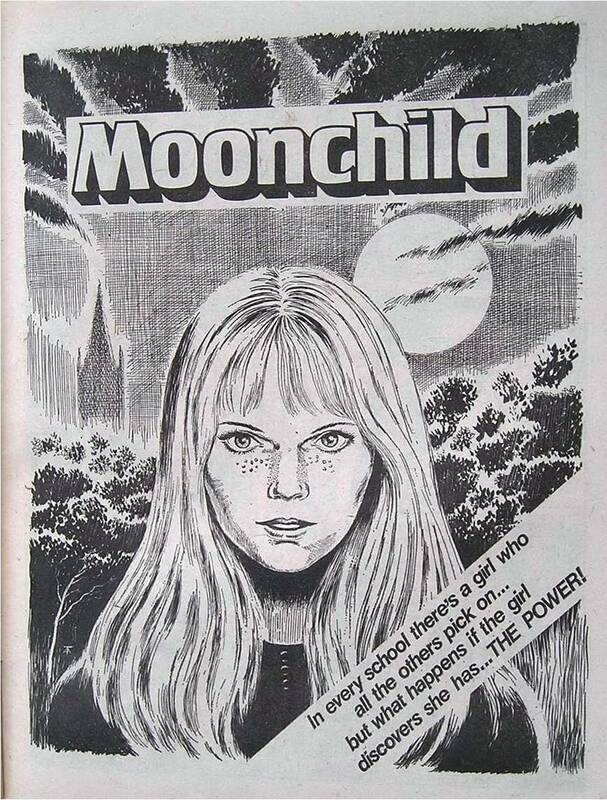 They’re from Moonchild, by me and John Armstrong, the top artist in girls comics. And my short story called Roots. Don’t know the artist, I’m afraid, but it’s beautifully drawn. I’ve blanked the last picture out which was too safe and reassuring and was added by editorial, against my wishes. I wanted it to end on this note of horror with no punches pulled. Some of my other horror stories were similarly toned down by editorial, applying “old school” thinking – not to scare the readers “too much”. 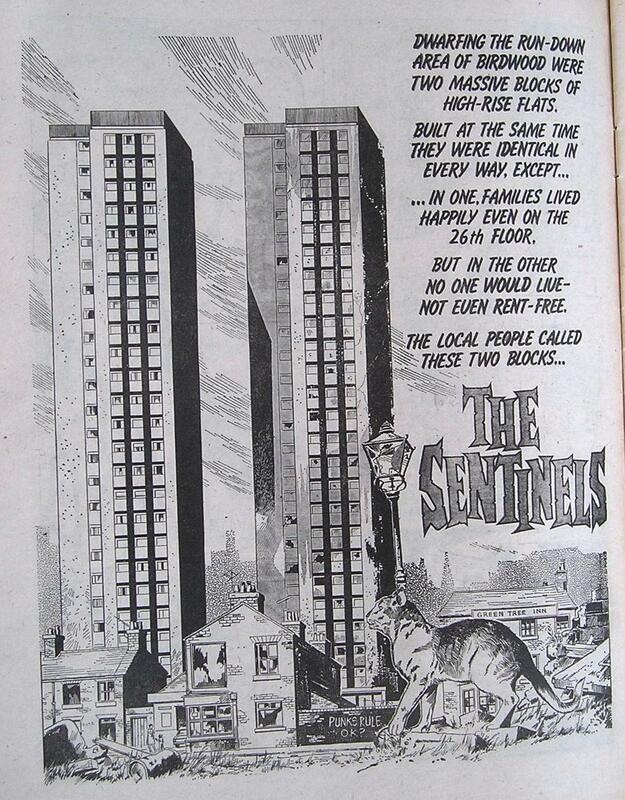 Next are three pages from The Sentinels by my colleague Scottish writer Malcolm Shaw about a tower block which shares an alternative reality with a Nazi-occupied Britain. Many Misty readers recall The Sentinels with particular affection. Malcolm, who sadly died very young, was same generation as John Wagner, myself and Gerry Finley-Day (creator of Tammy). Why was it mainly guys on girls comics, I hear you ask? Answer: because all the younger female magazine journalists looked down on girls comics and didn’t want to write or edit them, aspiring to teenage and women’s glossy magazines instead. 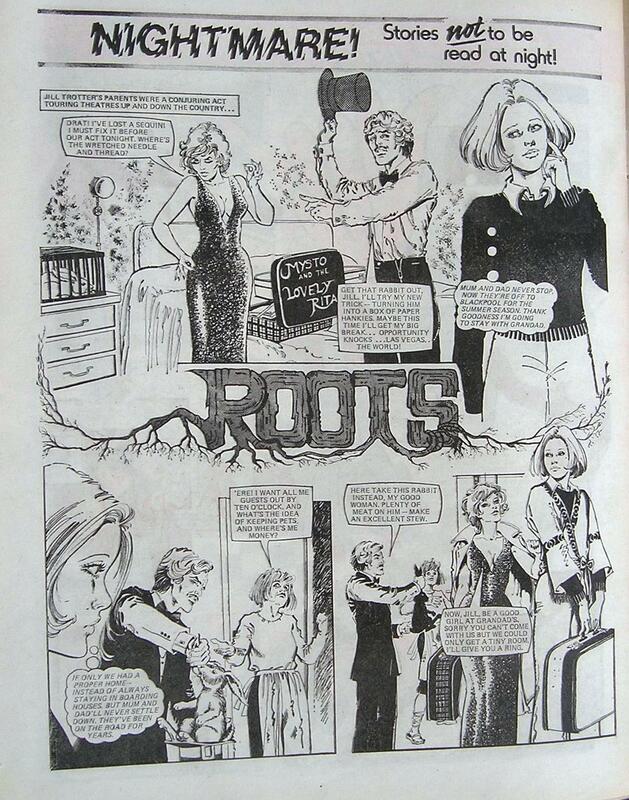 Malcolm was a brilliant writer of girls comics and also some early Judge Dredds. 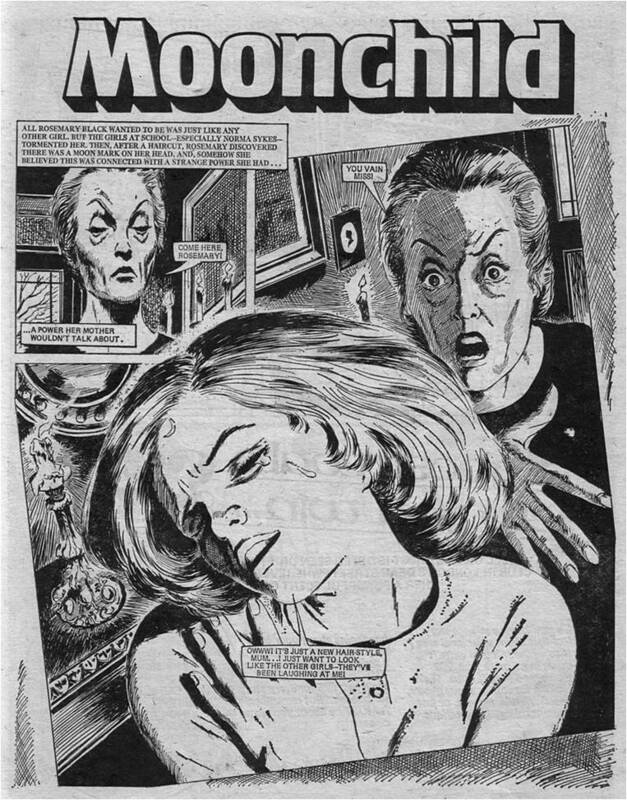 We started Jinty together, dreaming up a selection of stories, before Mavis Miller (previously editor of June) was appointed editor and turned it into a very successful comic with a strong science fiction edge. Malcolm really deserves a separate article on his important contribution to the Comic Revolution, but I only worked with him for a brief period, so my knowledge of his work is rather limited, I’m afraid. 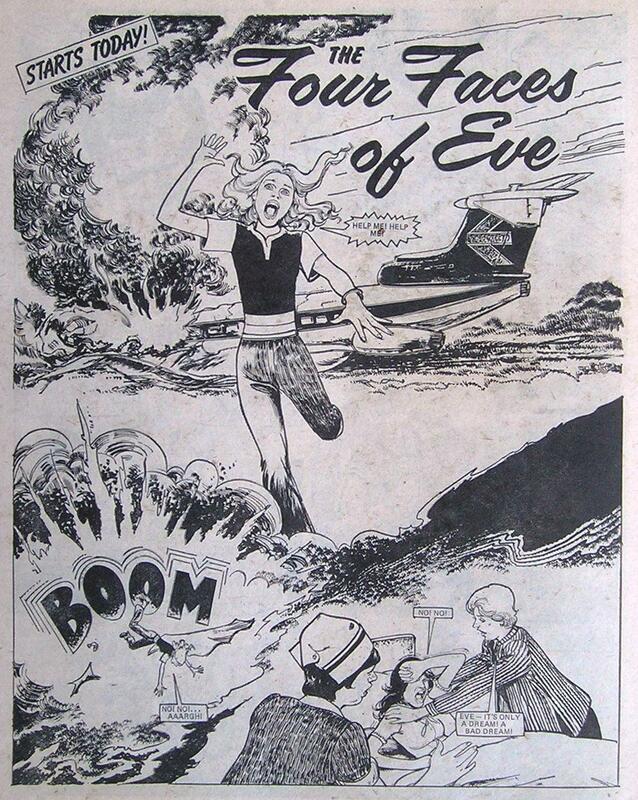 Another of his excellent Misty stories was Four Faces of Eve about a girl who looks absolutely normal but is really a female Frankenstein’s monster- she’s actually made up of four girls. That was a truly awesome and scary serial with great art by Brian Delaney. I’ve always regretted not creating Misty the way I created 2000AD. I’ve little doubt if I had, it would still be around today and it could have changed the British comics landscape for the better. Alas, Misty eventually died, for the reasons I’ve given, but it’s still well-thought of to this day. Many of us hope it could be reprinted with collected stories, just as 2000AD stories have been successfully collected. 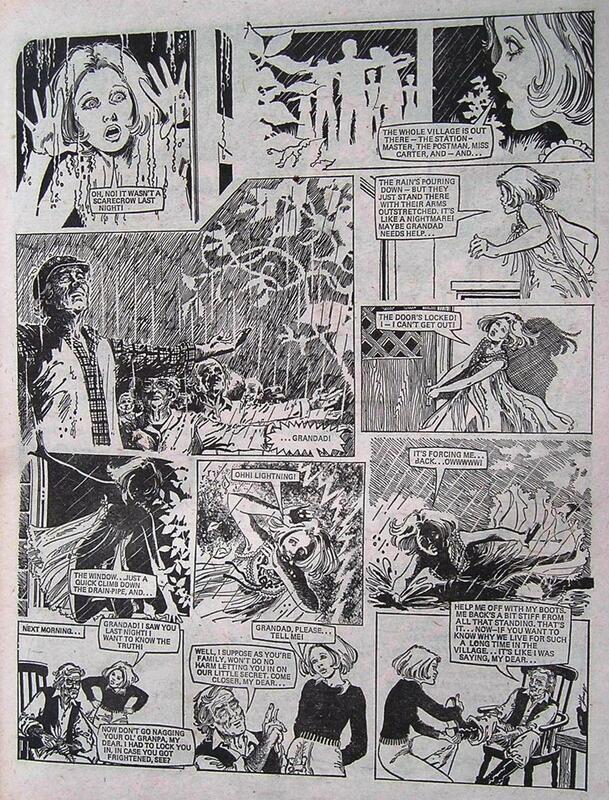 There’s a huge archive of supernatural girls comic stories from Misty that would make a great Best of Misty which would appeal to new readers as well as nostalgia readers and their daughters. Although they would need to be the right stories. A Misty Souvenir Special (2009) bombed because – as Misty readers confirmed to me – it was The Worst of Misty. Whoever put it together hadn’t got a clue what the comic was about and just slung together a collection of boring features, text stories, and “nice” safe, mildly creepy, self-contained comic strip stories. But it seems to me there is a chasm in the market for female comic readers. Significantly, Twilight,Vampire Diaries and House of Night are in the same genre and are trying to fill that gap by adapting their text to graphic novels. And Misty works for us guys, too, of course. Great stories and great artwork cross generations, age-groups and gender. I loved how it was building up and how they discovered her powers after a while. I would like to read more of those sorts of comics. It’s really exciting, and it always leaves a mystery at the end of each page. Clearly they are timeless classics, rather than ephemeral. None of these young readers thought they were old fashioned. A contact of ours (Jo Bevan) is passionate on this subject and recently carried out a larger, more detailed survey on kids’ reading habits, with encouraging results. Over two thirds wanted to see more comics available. Jo is active on the influential Mumsnet and started an interesting thread where many mums were complaining that there were no decent story-based comics for their daughters – or their sons, for that matter. 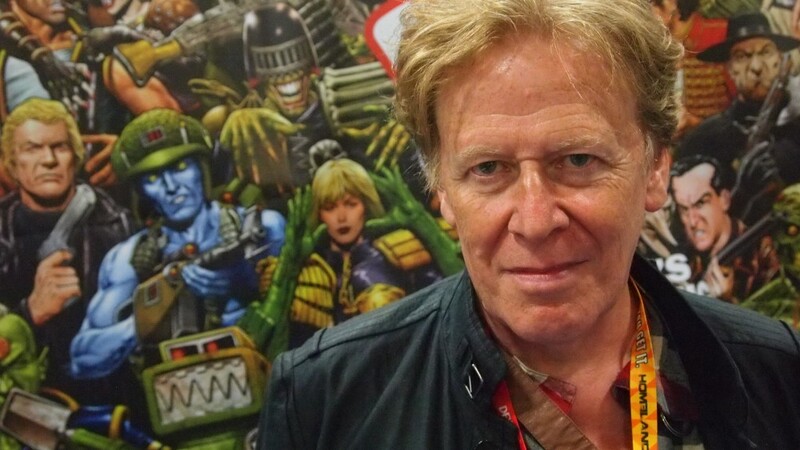 I know several women in the media who grew up with and were influenced by Misty, just as 2000AD inspired many artists, directors and writers. A few months ago it was mentioned in the Daily Mail You magazine where renowned artist and designer Julie Verhoeven found Misty’s dark and mysterious content an inspiration. 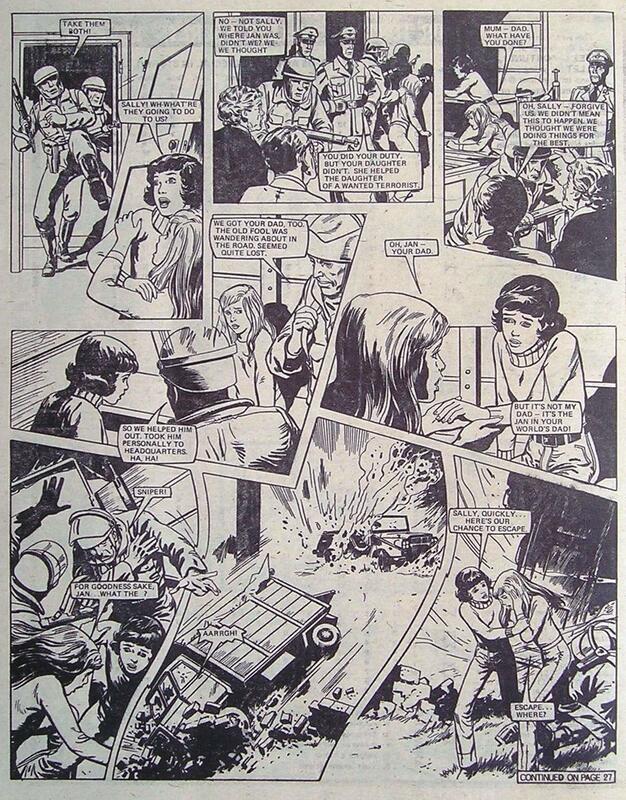 As John Freeman (Down the Tubes) said to me, “With writers Jacqueline Rayner out there (as well as yourself) pushing girls comics, why the hell is no-one reprinting them?” Jacqueline’s Guardian article is here, and she also has a very entertaining blog on the subject. Good question. And with films like Hunger Games – a typical girls comic story – and Black Swan and Twilight, doing so well, how risky is it to do a Best of Misty? My good friends at Titan Books had the option to reprint Misty, but unfortunately they couldn’t find anyone to edit it at the time. That’s totally understandable. It is a specialist subject and you do have to know which were the cool and popular stories. (Damn! I should have suggested I’d edit it, just to get it out there.) So Titan handed the project back to copyright holders, Egmont, who have since turned down at least one publisher from reprinting it because they weren’t big enough. They may be hoping for a larger publisher, but I fear only Titan is the likely contender. I’ve suggested it to other publishers I know but it’s simply not their genre. So it doesn’t look good at the moment, but we can still hope. If Egmont gave Titan a new license, I’m sure it would do well for them. If you’d like to see Misty reprinted, do give Bring Back Misty a look. Or ask Titan to reconsider (readerfeedback@titanemail.com). Or I’ll pass on your thoughts to them. If there’s no-one else available, I’d edit a collection, just to see it return. Slaves of War Orphan Farm. The wartime evacuee farm is run by the cruel Ma Thatcher (based on Mrs T, then infamous as Thatcher the Milk Snatcher) and was truly terrifying with the evacuees having to fight, escape and defeat genuinely evil monsters. Ella on Easy Street – a profound and cool attack on middle-class values with beautiful artwork by Casanovas. Ella sabotages her parents plans to better themselves. She wants to stop them becoming high-achieving yuppies because she fears it could break up their happy family. And Aunt Aggie: a working class, eccentric, ‘salt of the earth’ TV personality and national treasure with a heart of gold who makes children’s dreams come true on her mega-popular TV show, visiting orphans and helping the sick and the vulnerable. Behind the scenes, she cheats and mocks kids, hates them and lives a secret life of luxury, driving around in a customised Rolls-Royce. The heroine is Aunt Aggie’s orphan side-kick who sets out to sabotage her cruel plans. Okay, sorry for that interruption, my normal Dredd chapter will be continued in my next post with: “Don’t mention the Silver Surfer”. 2016 edit: If you want find out more about my new novel, Read Em And Weep: Serial Killer, due out in February 2017, click here to stay in touch!